this blog is about my family, and the issues that come from being a stay at home father of 5 kids, 3 of who are blessed with special needs of one kind or another. Briefly, I will talk about me. I am going to be 40 soon. Not tomorrow, but soon. Last year a week after my birthday I had a series of mini strokes or TIA’s as they are called. My wife made me promise that I would live to see 40. A couple of times in the last year I wasn’t sure that I would make it. But that date is coming. 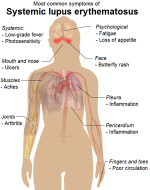 I have Systemic Lupus. I have Fibromyalgia. I have Hypothyroidism. I am not healthy. Well, maybe I should qualify that. I am as healthy as I can be given the circumstances. Why do I take the time to write this post? Simple. If I don’t take care of my health, I can’t take care of my family. I have applied for disability and am working on an appeal of the decision in my case. It is frustrating to have a complete stranger tell you that you can work a normal job without limitation. Most days, it is all I can do to get out of bed. For the most part, I live on a couch in my living room. I do get around. Today is the first time in about 2 and a half months that I have had to use my canes. I am seriously thinking I might need to use my walker this week. I am just dragging. I am currently taking a high dose of steroids to keep my symptoms under control so that the disease modifiers a chance to work in my system. Today when I was at the clinic for my son, I had them check my blood pressure. 138/82 which is good for me. I have pain in the left side of my body, mostly my leg. I don’t have pain in my head. I have numbness in the left side of my face. This is what happened last year when I had the TIA’s. Sadly the doctor told me that there isn’t much they can do for them since I don’t have any blockage in the arteries in my neck. So heed these words if you are reading this. Take care of your health. Life is precious and should never be taken for granted. Until tomorrow my friends. I hope you have a good night.